Cocky Assistant District Attorney Alec Pierce lives in the shadow of his politically connected family. A life of privilege doesn’t equal a life of love, a fact made obvious at every family gathering. Driven yet lonely, Alec yields to his family’s demands for his career path, hoping for the acceptance he craves. Until he meets a gorgeous biker who tips the scales in the favor of truth… and he can no longer live a lie. Can two men from completely different worlds… and sides of the law… find common ground, or will all their desires only wreak Havoc? 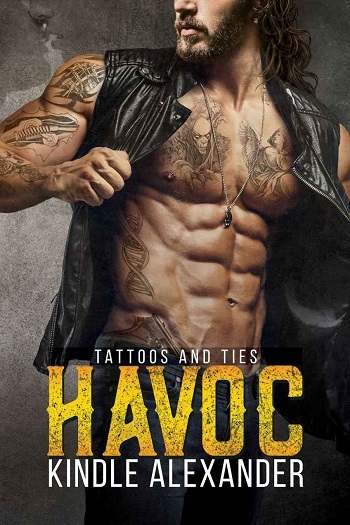 Havoc is the first book in the Tattoos and Ties series. The long-awaited new release from Kindle Alexander. Keyes and Alec are the perfect storm of opposites attract. Key is a patched member of the Disciples of Havoc and runs the club’s tire shop. He's living with his father, who insults him at every turn for being gay. It's known throughout the club, but Key keeps that part of him to himself. Key knows that the club and the tire shop are his life, but one unexpected stranger has Key questioning everything. Alec has known a life a privilege. He has an overbearing father who wants to use Alec's homosexuality for his political gain, and not because he approves of that lifestyle. Alec and his best friend, Blaine, breakdown on the side of the road in the wrong part of town. Help comes from an unlikely place, a gorgeous bad boy biker. The chemistry is instant between Alec and Key. The ride that Kindle Alexander takes you on is so worth it. I can't wait for more of this series! I was so excited for this book. I love bikers and I love Kindle Alexander. However, this wasn’t quite the read I was expecting. Keyes is more mechanic than outlaw and the story is surprisingly thin on action and drama. Both Keyes and Alec are likeable characters. There are some steamy moments between them and I enjoy the culture clash as they come together. But their relationship doesn’t develop very fast or very far in this story. There are suggestions at the start of the book of all sorts of things that could happen to Keyes and Alec, but this is a long book and it feels like nothing really happens. I kept waiting for an exciting storyline about bikers vs law enforcement vs politicians to take off, but no. Keyes and his club spend most of the book laying low and Alec finds himself doing child protection law. Even the promised drama from Keyes and Alec's respective families never quite materialises. It took me until about 80% before I realised that this was the first book in a series that would be wholly about Keyes and Alec. That possibly explains the lack of relationship development in this book – but it doesn’t quite explain the lack of action. Surprisingly for this type of book, there wasn’t anything at the end of this book that left me desperate for the next. So, after eagerly anticipating this story, my response to it was pretty tepid. Maybe I’ve missed something, maybe I was just in the wrong headspace, but this didn’t quite work for me. Holy hotness! What a great start to a new series. I tend to have a soft spot for opposites attracting since my hubby and I are polar opposites. Keyes and Alec have off-the-chart chemistry. I'm glad that the relationship was focused on mostly and not the club or politics. I will say I was a tad shocked that it wasn't really a happily ever after, more like a to be continued. I had assumed maybe each book would be for other characters. Overall, a very good book and I can't wait to see what happens. This is the ultimate not-suitable-for-each-other romance. Keyes is a tattooed biker who runs a tire shop and, on the side, accompanies runs for his club, for which he is well paid. He also deals with his homophobic father on a daily basis. Alec is the lawyer son of a senior politician and independently wealthy. He is generally ostracised by his family due to his homosexuality, but recently it would seem he might come in handy politically. Kindle Alexander has a great skill in creating people who have lots of layers and helping us peel them away and get to the heart of who they really are. Often, they learn along with the reader just what is important and how to reconcile their lives with their desires. Certainly here we get a lot of chemistry, and it takes the men some time to understand how to enjoy it and still keep their everyday lives intact. What they have to do is work through the havoc their relationship creates and decide what this means for the future – a word neither of them have dared consider before. I read Havoc without having even looked the blurb. The author's name was enough to have me eager for this book and the hot cover helped too. Alec is a lawyer with the DA's office. Keyes runs his own tyre shop and is a member of a motorcycle gang that is raided by the Feds. The set up for this story was fantastic and I had really high hopes. We get to meet and learn about each of the men before they meet each other on a dark road in a not so great part of town. The chemistry between Alec and Keyes is off the charts right from the start. These guys come from and inhabit very different worlds. If their connection and budding romance was known to either the MC or Alec's employer and family, it would not end well for them. The forbidden nature of their relationship added to the excitement and had me wondering how this couple could ever make it work long-term. As we moved into the latter parts of the story, I was expecting more action or drama but it never eventuated, instead focusing on our couple and their relationship. I enjoyed seeing them get to know each other and I feel we are only just scratching the surface with these guys and I want to know them more. I did find the story a bit slow towards the end and when we got yet another naked scene, I just wanted to see the story move along. But clearly, the more story I was after is still to come in the next instalment of this series. Havoc is a good start to a new series and I look forward to reading book two to find out where to next for Alec and Keyes. Usually, I try for funny. Humor is a major part of my life – I love to laugh, and it seems to be the thing I do in most situations – regardless of the situation, but jokes are a tricky deal... I don't want to offend anyone and jokes tend to offend. So instead I'm going to tell you about Kindle. I tragically lost my sixteen year old daughter to a drunk driver. She had just been at home, it was early in the night and I heard the accident happen. I'll never forget that moment. The sirens were immediate and something inside me just knew. I left my house, drove straight to the accident on nothing more than instinct. I got to be there when my little girl died – weirdly, I consider that a true gift from above. She didn't have to be alone. Her name was Kindle. Honest to goodness – it was her name and she died a few weeks before Amazon released their brand new Kindle ereader. She had no idea it was coming out and she would have finally gotten her name on something! Try finding a ruler with the name Kindle on it. It never happened. Reviewers on the Wicked Reads Review Team were provided a free copy of Havoc (Tattoos and Ties #1) by Kindle Alexander to read and review for this tour.